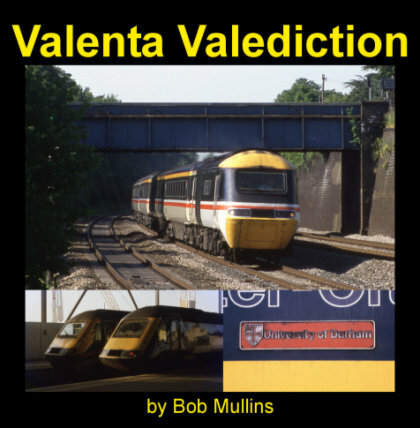 High Speed Trains in action, recorded by Bob Mullins at a wide range of locations. Published by Ian Strange. Recorded during 1984 to 2008. ** On-train departures from St. Pancras and Kings Cross. ** Busy HST comings and goings at Wellingborough. ** Grand Central and GNER HSTs tear through Sandy. 1 - HST power car, 43073, erupts into life at Nottingham ready to power a morning service to London, with only one scheduled stop at Leicester. On board, the express glides under Carrington Street and accelerates through the Nottingham suburbs towards Trent Junction (25/1/03). 2 - A used can is moved by the wind created by the passage of a HST as it roars through Loughborough on a Sheffield to St Pancras express (19/4/97). 3 -With snow about to fall, a guard’s whistle and a loco horn are heard before a London bound HST departs Leicester with power car 43075 at the rear (5/2/86). 4 - After a heavily delayed trip from Stratford-upon-Avon, weary rail tour passengers erupt with resigned laughter at the news of another delay, this time for cows on the line. Eventually, at nearly 21.00 hrs, departure south on a normal service (a HST) takes place and it is heard from onboard accelerating in the dark out of Leicester (24/4/93). 5 - A HST departs northbound from Wellingborough, leaving 56078 idling on the slow line platform as another HST arrives on a southbound train (20/5/84). 6 - On a cloudless warm Spring evening, birdsong proliferates before sounds of activity inside the Wellingborough station signal box are heard as a HST approaches from the north and passes through non stop. Soon after, another HST passes in the opposite direction and is heard for some while heading towards Kettering (20/5/84). 7 - Inside the same Wellingborough station signal box as a HST rushes northwards with horn blaring after which the signal levers are heard being operated (20/5/84). 8 - Rain is pouring down as a HST rushes through Wellingborough heading northwards (8/4/04). 9 - On board, as 43115 accelerates away from a short stop near Ouse Bridge north of Bedford and draws to a stand in platform 1 with a St Pancras service . Departure past the emu sidings is cautious before crossing over to the up fast at Bedford South Junction (25/8/84). 10 - On board an evening Nottingham / Derby bound HST as atmospheric station sounds are heard prior to departure. As the train slips away into the night a pronounced “flat” is apparent, however, acceleration past Kentish Town and through Belsize Fast Tunnel is brisk with the recording continuing past West Hampstead and Cricklewood (23/11/84). 11 - On board, as a New Street bound HST patiently waits for a path at Proof House Junction as other trains clatter past. Eventually, the HST is given the all clear to proceed and passes through New Street South Tunnel before entering the cavernous station (5/11/94). 12 - Under the impressive overall roof of Carlisle station a busy scene is apparent as 43065 waits for departure with a service to Plymouth. The HST departs in true style with the Valenta sound reverberating under the 1880 roof (27/8/91). 13 - During diversions away from the North East / South West main line, a HST is heard passing non-stop through Leamington Spa with the northbound “ Pines Express” a name redolent of years gone by. It was very unusual to see passenger trains pass non stop through Leamington and Banbury as all normal services call (24/4/93). 14 - Power car, 43098 “Railway Children”, is brought to a stand on the up fast at Stafford waiting for a road onto the Grand Junction line to Birmingham for its trip to the south west. After a brief wait the green light with feathers shows and the train moves off (15/11/97). 15 - Easy does it , as first one HST and then another romp up the steep gradient of the Lickey Incline past Vigo bridge, which is about 2/3rds of the way up (16/6/01). 16 - At Kings Cross on board the 05.43 am to York (the first express of the day) as HST 43120 departs and glides into Gasworks Tunnel . Once inside the famous tunnel the roar of the Paxman Valenta becomes almost deafening as it powers up the 1 in 107 gradient. With both front and rear power cars running well speed rapidly picks up through Copenhagen Tunnel and beyond (22/11/86). 17 - Grand Central introduced a service from Sunderland to Kings Cross from March 2008 and initially used shortened HST Paxman Valenta sets. One of those sets is heard at Sandy rushing south at the maximum speed of 125 mph or could it have been a little higher ?! (21/6/08). 18 - By way of contrast with the previous track, a GNER HST set rushes northbound at Sandy and is followed immediately by an announcement about a steam special. A 317 departs before Standard Class 5, no. 73096, passes with the “Nene Valley Rambler” (5/4/03). 19 - Ancient and modern - In the dark, 6024 “King Edward 1 “ running as 6018 “King Henry V1” pounds along south through Sandy with the return working of “The Golden Exchange” tour from Leeds to KX and is met by a HST speeding north (22/11/98). 20 - The sheer awesome power of the HST’s is displayed here as one storms through Grantham bound for Kings Cross (17/5/97). 21 - Onboard a HST at high speed as it passes over the famous flat crossing at Newark and is passed by another one at high speed (31/1/87). 22 - Friday evening rush hour at Paddington with a Worcester and Hereford bound HST awaiting departure and loudspeaker announcements in the atmospheric train shed. Whistles sound and eventually the HST glides out (24/8/90). 23 - HST in trouble (1) - On board the 12.00 to Cardiff and Swansea the electronic all clear to depart mechanism is clearly not working. Welsh passengers come aboard and the guard can be heard telling Ken, the driver, it is all right to go. 43002 “Top of the Pops”, the rear power car, then moves along the platform and picks up speed rapidly as it powers westwards (22/11/86). 24 - Expectant enthusiasts chatter in the background as three HST’s and a Thames Turbo rush through on the fast lines at a busy Ealing Broadway station. The object of their attention, 71000 “Duke of Gloucester”, then arrives on the slow line with a special to Stratford-upon-Avon providing a comparison between old and new traction (11/12/04). 25 - HST in trouble (2) - A class 50 idles in a bay platform at Oxford as an announcement is made about a delay to the down “Cathedrals Express”. Later, the “Cathedrals” departs behind 47571 hauling a HST set with only the rear power car in operation (9/9/88). What Might Have Been ? 26 - DPS “Deltics” 9009 “Alycidon” at the front and 55019 “Royal Highland Fusilier” at the rear rush the Northern Belle stock into Roade Cutting on the WCML but both are under power - a Deltic HST ?! (30/5/99).